Hi, over the last year my neighbors cat has been wandering into my house and playing with my cross Pitbull/Shar-Pei dog. I know this is a confident cat. But they have become best friends, often sleeping together. From the first time I met Cloe, the cat, I noticed it had no pupils. Night or day there is never a pupil present that I can see. Its vision is impaired. It is great with moving objects but a little impaired with still objects; not that it walks into things too much, but depth perception is a little off. I notice that it hesitates a little more than other cats but still gets around fine from what I can tell. I hope you can help Cloe the glowie green eyed cat. Update: From what I can see is that the third eyelid is functioning well. The eyeball has a thin coloured ring of light brown. I assume it is the iris and then there is nothing but a green or blue glow like a cat at night. There is never any black colouring in the eye ball at all. So I assume it is wide open letting in maximum light at all times. Hi Daniel.. thanks for sharing. It is nice to see Cloe getting on so well and so fast with your dog. Credit to both of them! 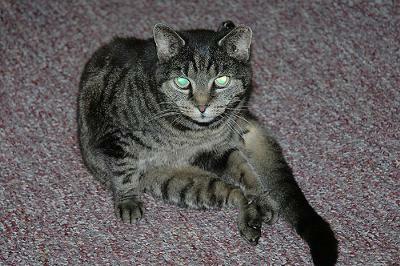 What is glowing green is the special reflective layer behind the retina of the cat's eye that boosts the amount of light collected by the retina. This allows the cat to see well at night. As you see it all the time, the pupil is dilated all the time. What causes this? I will go through all the relevant possible causes as per the Cat Owner's Home Veterinary Handbook and leave you to make up your mind. Key-Gakell Syndrome: a rare autonomic nervous system (the nerves that control lungs and heart etc.) disorder that causes dilated pupils and prolapsed ("to fall out of place") third eyelid. Retinal disease: this causes blindness. If a cat is blind the iris will not react to reduce the pupil size. Retinal disease might take the form of Progressive Retinal Arophy (PRA) - degeneration of the cells of the retina over time - or Retinitis - inflammation of the retina. There is no treatment for PRA while in respect of Retinitis there is hope of saving vision depending on the cause. Feline Hyperesthesia Syndrome: this is either a behavior or neurological problem that causes the pupils to dilate (often) and skin twitching, tail whipping. The cat doesn't like being touched. I don't think that this is relevant. Feline Hyperesthesia. Of all the above possible conditions my bet is that Chloe is going blind due to PRA or Retinitis. I would have the vet check her out asap. Hope this helps and good luck to Cloe, you and your nice dog.